This movie did it's own thing and should be held to it's own level of excellence. A lot of the critics were trying to compare this movie to a lot of the movies that came out in the 90's and while they share the same elements when it comes to story telling, Dope does it's own thing and made a path back towards an important level of storytelling sorely missed in the African American community. When watching this movie and analyzing further and further into what it was rather than what people wanted it to be, I appreciated it more and more. 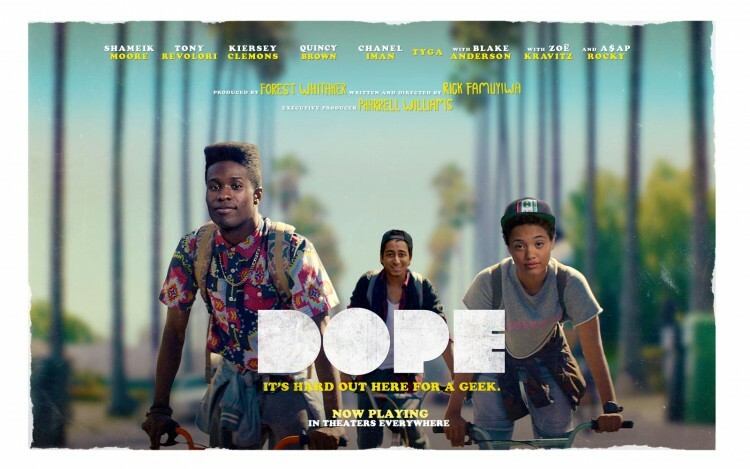 I will agree that Dope is a coming of age movie in a sense that it steers away from your typical movie roles that African Americans are being cast in. This movie did so many things right I honestly don't know where to start. In the beginning it payed homage to the 90's by incorporating elements of storytelling that amplified social problems existing while telling a story of a group of kids doing what they want, regardless of what people say they should be doing. I think it was a pretty nice touch that they tied in The Wood with this movie by having Stacey in there as a school security guard. We were all thinking & it was awesome for it to be confirmed, thanks writers. The cast did it's job to a T with leading man Shameik Moore doing a solid job. A$AP Rocky wasn't an annoying nuisance in this movie and actually contributed fairly nicely. I've been fairly lukewarm on Zoë Kravitz roles so far but I loved her in this movie. She played the role of the beauty everyone was chasing after to perfectly, (and she didn't look bad for a second while doing so). It was also nice to see Kimberly Elise, Rick Fox, Keith Stanfield, Chanel Iman, Roger Guenveur Smith, Vince Staples, Casey Veggies & Forest Whitaker as the narrator was a nice touch. This movie did more than what was expected from me and I'm planting it within my top for the year. They have the story, they have the cast, they have the elements of nostalgia and they made the story their own; it literally did no wrong here. In a time where storytelling isn't a focus and when African Americans aren't given a chance to shine this movie succeeded in both of those areas and will be held to a higher light once people get a chance to see this film. It only made 18 million in the theaters but once it gets added to avenue where people can more readily check it out, (because it wasn't in theaters in my city of Raleigh so I know smaller markets didn't have it), I know more people will be talking about this. I definitely recommend anyone who hasn't seen this film to go out and and see it. If you did see it tell me how did you like the film? Leave it in the comments below, you know I love hearing from you guys. Oh yea, anyone else satisfied that Tyga was shot within 3 minutes of his introduction?